Grace Hospital and its associates are required by law to maintain the privacy of our patients' Protected Health Information (PHI) and to provide patients with notice of our legal duties and privacy practices with respect to your PHI. We are required to abide by the terms of this Notice. We reserve the right to change the terms of this Notice as necessary and to make the new Notice effective for all PHI maintained by us. You may receive a copy of any revised notices at Grace Hospital or a copy may be obtained by mailing a request to the Grace Hospital Privacy Officer, 2307 West 14th Street, Cleveland, Ohio 44113. Your Authorization. Except as outlined below, we will not use or disclose your PHI for any purpose without your written authorization. You have the right to revoke that authorization unless we have taken any action in reliance on the authorization. Uses and disclosures of most psychotherapy notes, uses and disclosures of PHI for marketing purposes, and disclosures that constitute a sale of PHI always require your written authorization. For Treatment. We will use and disclosure of your PHI as necessary for your treatment. For instance, doctors and nurses and other professionals involved in your care will use information in your medical record and information that you provide about your symptoms and reactions to plan a course of treatment for you. We may also release your PHI to another health care facility or professional who is not affiliated with Grace Hospital but who is or will be providing treatment to you. For instance, if, after you leave the hospital, you are going to receive home health care, we may release your PHI to that home health care agency so that a plan of care can be prepared for you. For Payment. We will use and disclosure your PHI as necessary for the payment of services provided to you. For instance, we may forward information regarding your medical procedures and treatment to your insurance company to arrange payment for the services provided to you or we may use your information to prepare a bill to send to you or to the person responsible for your payment. For Health Care Operations. We will use and disclose your PHI as necessary, and as permitted by law, to run our health care operations, which may include clinical improvement, professional peer review, business management, and accreditation and licensing. 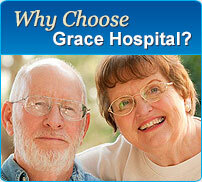 For instance, we may use and disclose your PHI for purposes of improving your care. We may also disclose your PHI to another health care facility, health care professional, or health plan for such things as quality assurance and case management, but only if that facility, professional, or plan also has or had a patient relationship with you. Our Facility Directory. We maintain a facility directory listing the name, room number, general condition and, if you wish, your religious affiliation. Unless you choose to have your information excluded from this directory, the information, excluding your religious affiliation, will be disclosed to anyone who requests it by asking for you by name. This information, including your religious affiliation, may be also be provided to members of the clergy. You have the right to have your information excluded from this directory and also to restrict what information is provided and/or to whom. Please inform your nurse of your preferences. Family and Friends Involved In Your Care. When you approve, do not object, or we reasonably infer that you do not object, we may from time to time disclose your PHI to designated family, friends, and others who are involved in your care or in payment of your care. If you are unavailable, incapacitated, or facing an emergency medical situation and we determine that a limited PHI disclosure may be in your best interest, we may share limited personal health information with such individuals without your approval. We may disclose PHI to a family member, relative, or another person who was involved in the health care or payment for health care of a deceased individual if not inconsistent with the prior expressed preferences of the individual that are known to Grace Hospital. We may also disclose limited PHI to a public or private entity that is authorized to assist in disaster relief efforts in order for that entity to locate a family member or other persons that may be involved in some aspect of caring for you. Business Associates. Certain aspects and components of our services are performed through contracts with outside persons or organizations, such as auditing, accreditation, and legal services. At times it may be necessary for us to provide your PHI to one or more of these outside persons or organizations. In all cases, we require these business associates to appropriately safeguard the privacy of your information. To contact you for fundraising efforts. If you do not want Grace Hospital to contact your for our fundraising efforts and wish to opt out of these contacts, or you with to opt back into these contacts, you must notify us in writing. Ohio law requires that we obtain a consent from you in many instances before disclosing the performance or results of an HIV test or diagnoses of AIDS or an AIDS-related condition and; before disclosing information about drug or alcohol treatment you have received. For full information on when such consents may be necessary, you can contact the Privacy Officer. Access to Your PHI. You have the right to copy and inspect much of the PHI that we retain on your behalf. All requests for access must be made in writing and signed by you or your representative. We will charge you a fee if you request a copy of the information. You also have the right to ask for a summary of this information. If you request a summary we may charge you a fee. You may obtain an access request form from the Health Information Management Department. Amendments to Your PHI. You have the right to request in writing that personal health information that we maintain about you be amended or corrected. We are not obligated to make all requested amendments but will give each request careful consideration. All amendment requests, in order to be considered by us, must be in writing, signed by you or your representative, and must state the reasons for the amendment/correction request. We will respond to your request within 60 days and provide you with a written explanation if we deny your request. You may respond to a denial with a statement of disagreement to be appended to the information you wanted amended. If an amendment or correction you request is made by us, we may also notify others who work with us and have copies of the uncorrected record if we believe that such notification is necessary. You may obtain an amendment request form from the Clinical Site Administrator or the Health Information Management Department. Accounting for Disclosures of Your PHI. You have the right to receive an accounting of certain disclosures made by us of your PHI after April 14, 2003. Requests must be made in writing and signed by you or your representative. Accounting request forms are available from the Health Information Management Department. The first accounting in any 12-month period is free; you will be charged a fee of $15.00 for each subsequent accounting you request within the same 12-month period. Restrictions on Use and Disclosure of Your PHI. You have the right to request restrictions on certain uses and disclosures of your PHI. A restriction request form can be obtained from the Health Information Management Department. We are not required to agree to your request but will attempt to accommodate reasonable requests when appropriate and we retain the right to terminate an agreed-to restriction if we believe such termination is appropriate. Grace Hospital will agree to restrict disclosure of PHI about an individual to a health plan if the purpose of the disclosure is to carry out payment or health care operations and the PHI pertains solely to a service for which the individual or another person has paid for in full. We retain the right to terminate an agreed-to restriction (unless the restriction is required by law), if we believe such termination is appropriate. In the event of a termination by us, we will notify you of such termination. You also have the right to terminate, in writing or orally, any agreed-to restriction by sending such termination notice to the Health Information Management Department. Inspecting and Copying your PHI. You have the right to inspect and copy PHI that may be used to make decisions about your health. Requests for inspection may be made to your doctor or nurse while an inpatient. All other requests to copy or inspect must be made to the Health Information Management Department. For PHI that is maintained in an electric format you may request an electronic copy for such information. There may be a nominal charge for these copies. Request for Confidential Communication. If you believe that a disclosure of all or part of your PHI may endanger you, you may request in writing that we communicate with you in an alternative manner or at an alternative location. For example, you may request that all communications be sent to your work address. Your request must specify the alternative means or location for communication. It must also state that the disclosure of all or part of your PHI in a manner inconsistent with your instructions could endanger you. We will accommodate requests for confidential communication that are reasonable and comply with the above requirements. In the event of a breach your unsecured PHI you will be notified. Complaints. If you believe your privacy rights have been violated, you can file a complaint with the Privacy Officer, 2307 West 14th Street, Cleveland, Ohio 44113 in writing. You may also file a complaint with the Secretary of the U.S. Department of Health and Human Services in Washington D.C. in writing within 180 days of a violation of your rights. There will be no retaliation for filing a complaint. Acknowledgment of Receipt of Notice. You will be asked to sign an acknowledgment form that you received this Notice of Privacy Practices. If you have questions or need further assistance regarding this Notice or would like to exercise any of the right described in this Notice, you may contact the Privacy Officer, 2307 West 14th Street, Cleveland, Ohio 44113, Phone: 216-456-3895.